Windward was first spied by our indie scout Tom Sykes, circling off the shores of Desura, en route to Steam Early Access. It's now docked in... er... no, sorry, let's abandon this sinking analogy. The top-down naval adventure has now left Early Access. The above launch trailer explores some of the things you can achieve in the procedurally generated pirate paradise. 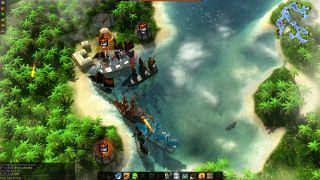 In Windward, you're able to help towns, gather resources and fight pirates. Fulfil a town's resource request and it can grow, offering you more quests and items—eventually letting you upgrade to bigger and better ships. Essentially, it's a big naval sandbox. Or the water-based equivalent of a sandbox. It also supports co-op, letting you travel with a flotilla of friends. Normally £11/$15, the game is 15% off until May 19.